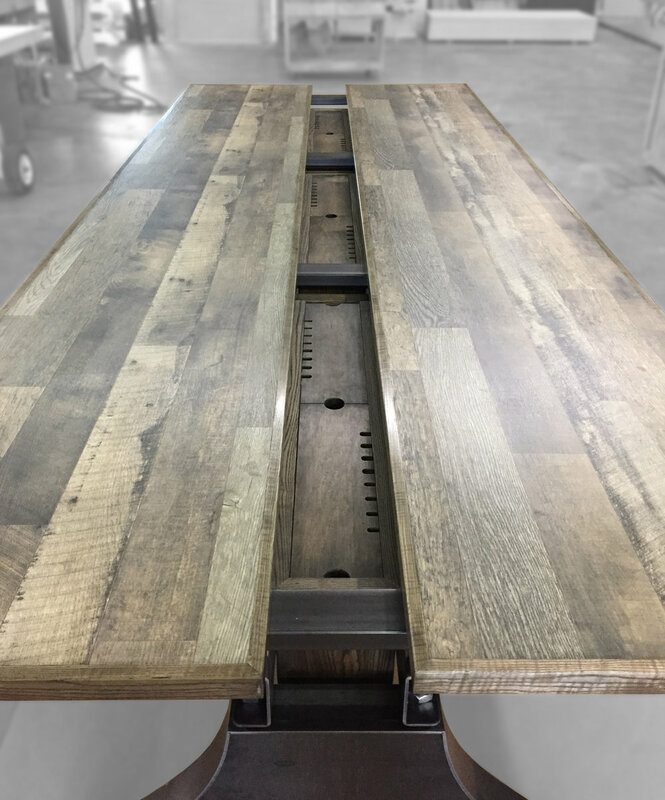 The Steel Keel Table is a beautiful industrial workspace table with integrated power and cable storage on a custom-designed steel structure. 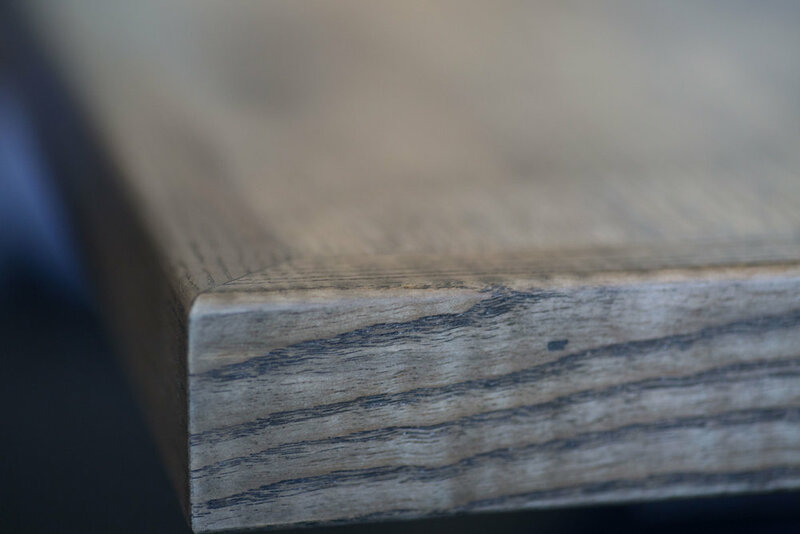 Real wood is paired with a planked wood laminate to create a work surface that is smooth and easy to write on, easy to clean and has eased edges for all-day comfort. 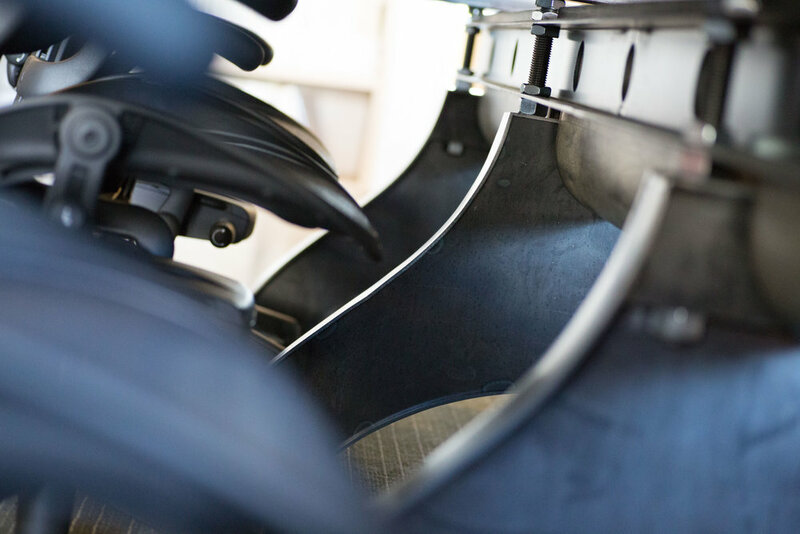 The steel legs and connecting beams are formed from thick laser-cut and welded steel plate that is joined with heavy all-thread rods and hardware to create one seriously strong structure. The central storage cabinets are trimmed and capped with real wood and rounded on the bottom like an old oak barrel. All combined, there are beautiful details everywhere you look. 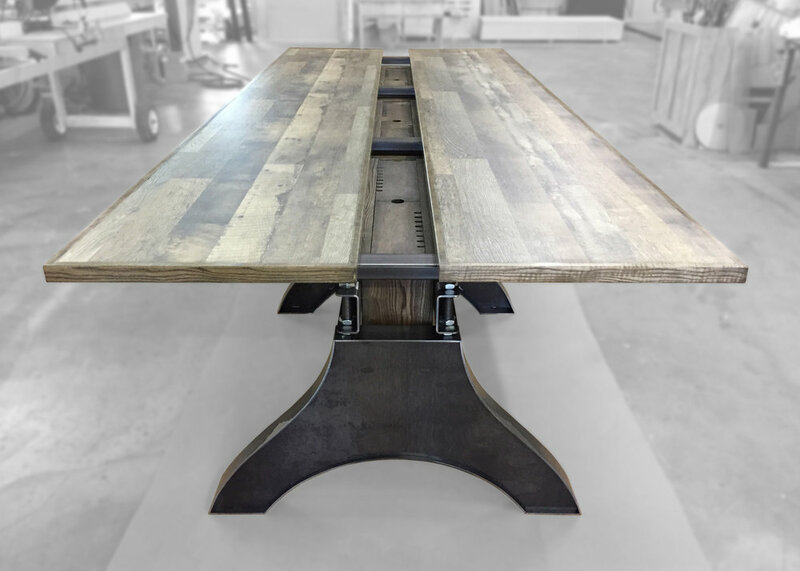 The table gets its name from the "ogee" arch of the steel legs, also known as a "keel" arch like the shape of a boat keel. 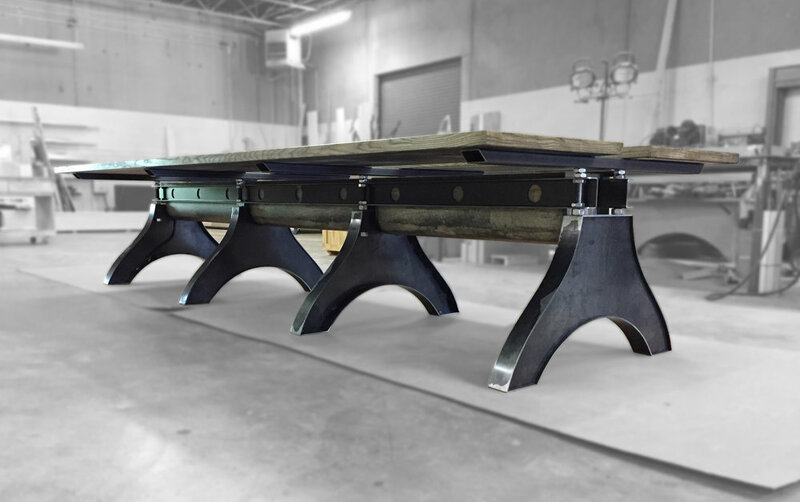 The 12' Steel Keel Table shown here features four custom steel bases connected with a rigid spine that comfortably seats six persons. However, the design is scalable up or down to meet your individual needs. The metal structure supports three large power and cable storage cabinets that conceal all cables and adapters down the center of the table. Each cabinet has two lift-out panels that allow users to arrange their cables any way they like, and any user can access his or her cables without interfering with another user's cabling. 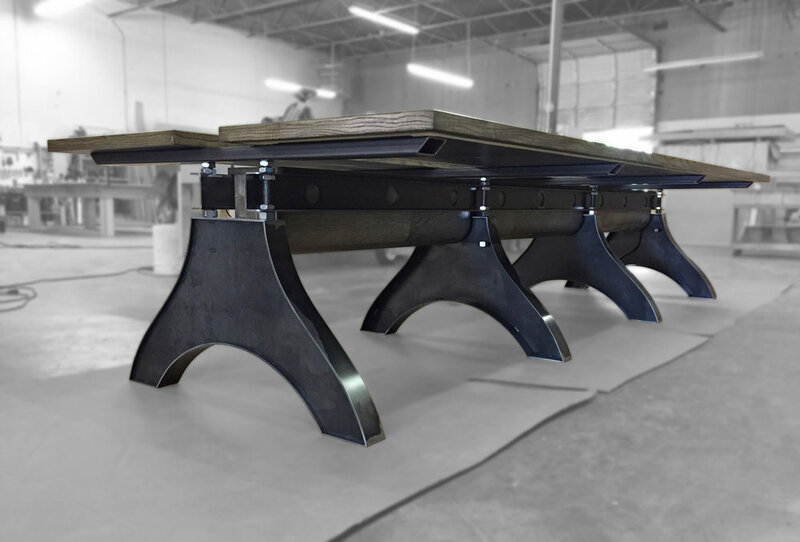 The Steel Keel Table can be customized to fit your needs. The base can be shortened or lengthened for different size tables. Legs can be moved or eliminated to accommodate various seating counts. Table tops can be shortened or even divided to provide different work heights for each user. No matter what your requirements, we can meet your needs. Years of furniture design shows in the details. Everything fits and works like it was engineered that way, because it was. It's details like slots in cable covers that are uniquely sized to prevent connectors from falling through, cable pass-thrus in the legs that conceal all of the wiring so that you only see the beautiful metal and wood structure, and power and cord management that can handle anything you can throw at it.